The unborn child's mother clung to life. Emily Ortega, just 21 years old, had been in an evacuation center when the typhoon hit the Philippines. When everything was washed away, when thousands died, she reportedly clung to a post. Emily Ortega was pregnant. And she survived. And today, amid all the ruin and tragedy, she gave birth to her precious girl whose middle name is Joy. 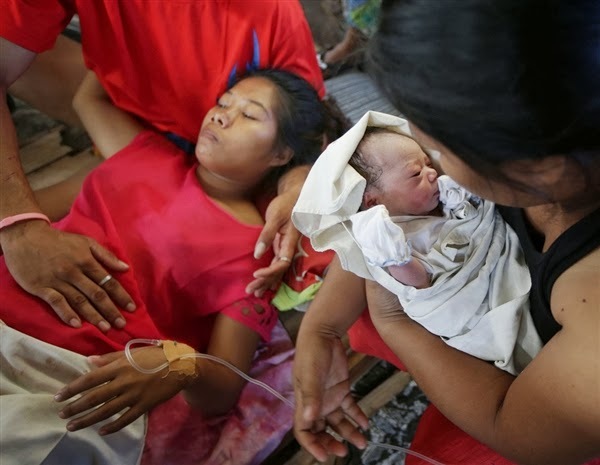 Bea Joy Sagales was born at an emergency clinic in a half destroyed airport. The name Bea is a family name. Emily's mother, who is missing, is named Beatrice. Some predict that up to 10,000 people may have died. But so severe is the destruction that it's still impossible to know. Christians are people of joy amid destruction. That's who we are. We don't see tragedy as evidence that joy doesn't exist. We don't believe that God chose Bea Joy and all those others to die. We don't think God is punishing the Philippines. But we see life as a gift and it is to be cherished. We should grieve for those who passed. We should help the survivors. But we should also take joy in the fact that a little girl with the middle name "Joy" was brought into the world. Sometimes we need reminding of how miraculous each life is. Because every life is sacred. And everyone is a miracle. Too saccharine Matt. I don't think the woman cnn showed ( or the thousands like her) who lost her husband and 6 children and home...I don't think she is in the state of joy because another woman gave birth. She has three of her children under a canvas blanket with their feet showing. And she'll be homeless for years to come with no children....no husband.